In the years after World War II, arts festivals helped counteract the sense of devastation across Europe, including the Athens & Epidaurus Festival which started in 1955. The following year, dance companies began performing in the shadow of the Acropolis, their works heralded as markers of national identity. The Athens Festival held geo-political significance due to Greece’s location between Eastern and Western blocs and attracted great interest from both sides of the political spectrum. American Ballet Theatre, New York City Ballet, Ballets: USA and Britain’s Royal Ballet represented the West while the Kirov Ballet appeared on behalf of the USSR. 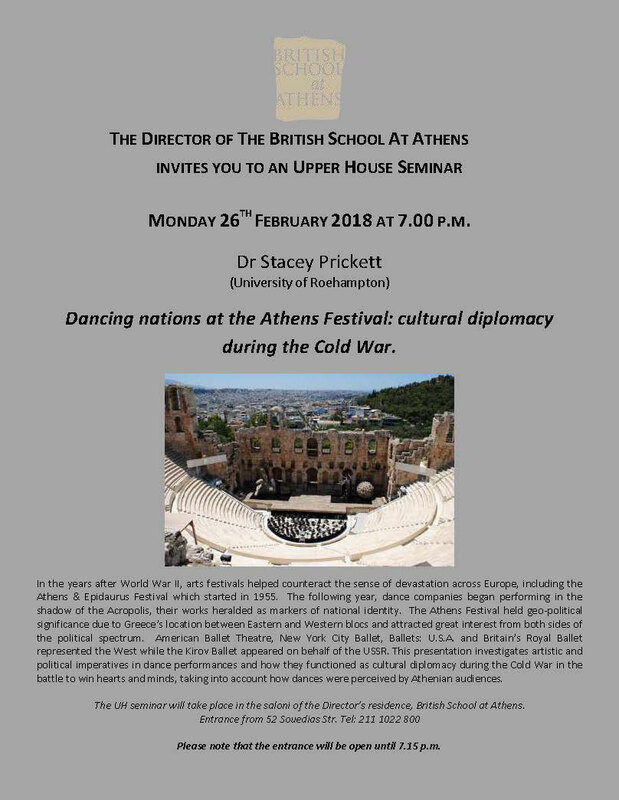 This presentation ivestigated artistic and political imperatives in dance performances and how they functioned as cultural diplomacy during the Cold War in the battle to win hearts and minds, taking into account how dances were perceived by Athenian audiences.